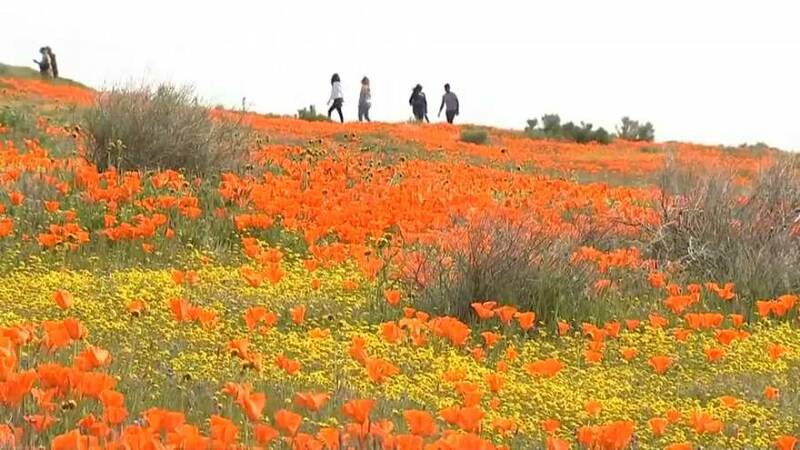 After a rainy winter, California has been enjoying what many are calling a "super bloom" of flowers and thousands of visitors a day are flocking to enjoy the natural phenomenon. However, after 2017's super bloom when visitors damaged much of the fauna, park rangers are issuing guidelines as to how to avoid environmental damage. Kevin Overduin, a state park ranger, was one of the officials who gathered to speak to media on Tuesday (March 26) at Antelope Valley in California about what not to do at any of the sites of floral explosions. ''The don'ts are don't jump over the fence, don't pass any boundaries, don't go off trail, don't go after the snakes, don't basically mess with any of natural resource as far as it goes with just observing it and touching it. Just observe it," he said.